Whether it’s award winning dining with a stunning view, a family holiday by the sea or a romantic break for two, everyone has their own idea of a perfect treat. 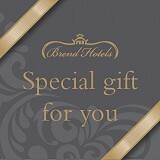 That's why a gift voucher for Brend Hotels is the perfect choice for any occasion. Your gift voucher can be sent by email or by post and can be personalised with your own special message. Postal vouchers are presented in a wallet. We can send vouchers to your own address or directly to your recipient and you can select the date on which the voucher should be dispatched.